Gilcrest Manufacturing were approached by an architect to develop a customised strong but lightweight panel for the purpose of monolithic signage. 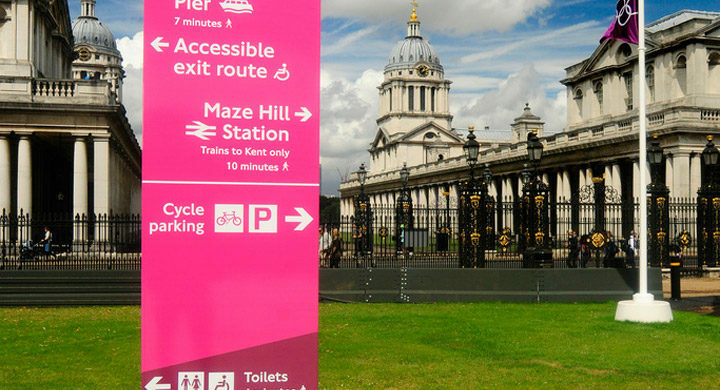 These signs were to deliver a directional sign solution for the London 2012 Olympic arena, where visibility and brand impact is key. The project brief was to supply and deliver a lightweight panel solution in multiple sizes that would achieve sustained performance and functionality. The material, therefore, needed to withstand environmental impact such as wind loadings and deflections, whilst the fixings to mount the system to the base had to meet high torque requirements. These torque requirements would ensure that a clamping force greater than the recommended tensile load was used in order to resist movement within the panel over time. As well as choosing a material that would withstand environmental conditions over a sustained period of time, event branding and visual impact was to be carefully considered and reflected within the chosen panel shape. Gilcrest Manufacturing provided a custom-made solution in the form of aluminium box frame panels, combined with a 3003 grade aluminium honeycomb core and skin. This material ensured that specific wind loading and deflection requirements were met, whilst its’ versatile structure enabled Gilcrest Manufacturing to create the desired curves for the panels’ shape. The aluminium skin was also folded flush with a minimal central joint to allow for vinyl wrapping. To meet the specified torque requirements, a specially sourced threaded insert mount system was incorporated into the panel design, which not only improved the panel strength and support structure but allowed for a concealed base fixing for enhanced aesthetics. Despite the restricted time requirements requested for delivery, alongside logistical challenges that often arise within large projects, Gilcrest Manufacturing were able to deliver the individually inspected panels on time within specialist packaging, to ensure optimum protection during transportation. The entire process from beginning to end required a high level of organisation and planning. Aluminium as the chosen material for the product panels specified is made from common metals, which means at the end of their useful lifespan they are typically easy to recycle. This reduces the amount of energy required to extract new materials, providing a cradle to grave service. The highly experienced Gilcrest Manufacturing team were focused on ensuring they provided the best possible product solution for the signage at North Greenwich. The chosen aluminium box frame panels not only met performance requirements but achieved the desired aesthetic for event branding. Gilcrest Manufacturing were delighted to deliver clear signage for visitors looking to enjoy the Olympic celebrations, making journeys as straightforward and stress-free as possible. To find out more about specifying Gilcrest Manufacturing panels for your next project, contact us.